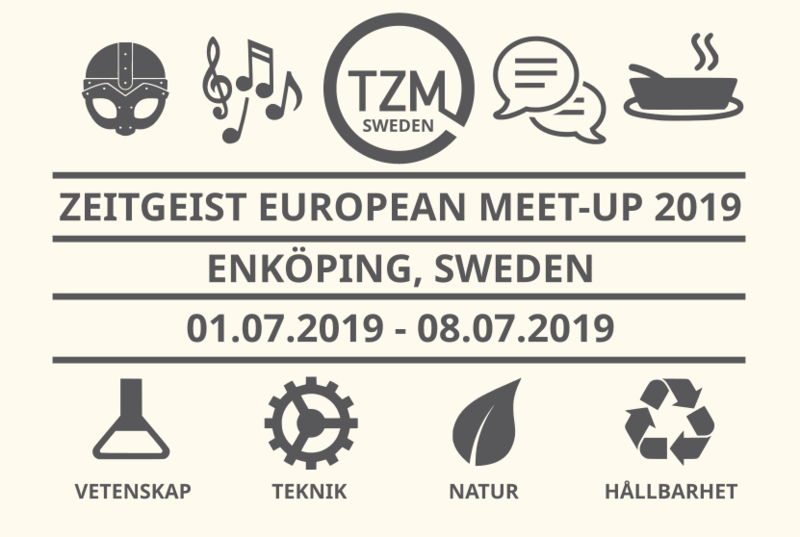 Welcome to the third Zeitgeist European Meet-Up of 2019 in Enköping, Sweden! What is the Zeitgeist European Meet-Up? This is an international gathering of members of the Zeitgeist Movement (TZM) or guests that are interested in TZM and that are located somewhere in Europe. The first European Meet-Up was held in Rotterdam, Netherlands in December of 2015. The second European Meet-Up took place in Kiev, Ukraine in July of 2017. Now, our third European Meet-Up is going to be held in Scandinavia, west of Stockholm and once again in the summertime, so that all of our guests may enjoy the beautiful weather and exceptionally long days that Sweden enjoys in the summer. What the Zeitgeist Movement (TZM)? If you have any other questions, please send us an email, write us on Facebook or other social media platforms. What happens during this event? This differs from, and is more comprehensive and personal than, other typical TZM events. Instead of only being overwhelmed by a bunch of presentations with lots of factual information, we are presenting a vacation-like event for people to have fun, socialize at, and enjoy. Keep in mind, as well, that this is going to be a very productive and idea-rich event, with many new insights regarding projects and developments happening within TZM. Numerous other like-minded people and organizations will also be attending this event. Why Sweden? TZM has already held the European Meet-Up in Western-Europe (the Netherlands), in Eastern-Europe (Ukraine), and now it is time to assemble elsewhere (Northern-Europe, aka Scandinavia) and bring a global TZM event into this part of the world. TZM has not recently been as active in Scandinavia as in much of the rest of Europe, the Americas and other parts of the world, which is why we are providing TZM Sweden with the opportunity to host this very large event. This opportunity will also be taken to show people from other parts of the world the culture, history, social structure and landscape of Sweden. There will also be much time to simply get to know one another, build new friendships, and hook up with old friends, in this atmosphere of community and fellowship. Just as at the first European Meet-Up in Rotterdam of 2015, we are back in school again for this meet-up! Due to the courtesy of the city of Enköping, we have reserved the school and its facilities for the entire week, where we will be spending the majority of our time during the event. Enköping, known as “Sweden’s closest city” because of its proximity to three of Sweden’s largest cities — Stockholm (#1), Uppsala (#4), and Västerås (#6) — is easily and directly reached by bus from Stockholm’s Arlanda airport, as well by bus or rail from Stockholm Central Station and the rest of the country. Enköping, you will come to see, is also close to both Sweden’s first city and its first known town, as well as to Viking burial mounds, runes and other important cultural and historical sites. Again, as with the TZM European Meet-Up in Kiev, we wanted to be in an area with plenty of fresh air to breathe, close to nature and filled with beautiful sights. So we are happy to announce that we will also be having a lot of outdoors activity at this TZM European Meet-Up! We are as now in the midst of sending out invitations and making speaker selections, organizing workshops, and booking entertainment. The goals of this year’s European Meet-Up include emphasizing teamwork, appreciating humanity and overcoming isolation. There will also a be predominance of Swedish and other Scandinavian culture, which will include contemporary music and arts, as well as old Norse (Viking age) culture and music, which is rooted in Sweden’s history. We are excited to present a program of optimism and fun, to get everybody involved in what we expect will be the largest TZM week-long event, ever! Stay tuned for forthcoming details and updates! Accommodations: The school provides many rooms for event activities, presentations, meals, bathrooms and showers, as well as lodging. Bearing in mind that there will be no beds provided by the school, we ask our guests to bring sleeping bags for their stay, just as we did at the Rotterdam European Meet-Up. If this is not a comfortable option, we will be presenting some recommended hotels and hostels in the area, which can serve as good alternatives. Take FLIXBUS from terminals 5 or terminal 2/3 to Enköping Central Station (this is both a train and bus station) Tickets are available through the FLIXBUS app or through kiosks located near the point of arrival in the airport at each terminal. The airport terminals feature extremely helpful information centers near your arrival area, which can help you book, purchase or locate the transportation option you desire. From Stockholm Central Station (T-Centralen): Numerous trains are available on a constant basis from Stockholm to Enköping. Enköping can be reached by train, bus or car from other locations as well, of course. Please note that it is conveniently located right along E18, one of the major European highways found in Sweden. Detailed maps for parking, making one’s way from the station to the school, and check-in / check-out times and procedures will be forthcoming, after you have purchased your ticket and as we approach the event dates. Special badges and registration procedures will ensure a safe and smooth event, and allow all authorized participants to easily enter and partake in all the meals and activities. Tickets: PLEASE EMAIL US AFTER PURCHASING A TICKET! We also invite you to message us through Facebook and actively engage in the pre-2019 European Meet-Up discussions. If you need assistance in finding a good route to Sweden or information on how to get to Enköping, PLEASE contact us! All participants must be 18 years of age and able to produce official government identification for insurance and security issues. We will be required to inspect and copy official identification documents at check-in and registration. Keep in mind that as the event dates approach, prices are expected to be increased due to an anticipated large, sellout audience and the substantial resources required to sponsor this event. When we reach 250 sold tickets, we will no longer have reasonable room for providing accommodations and it will be announced. However, we will still assist in looking for alternative accommodation for those in need. Nevertheless, there ARE limits, as well, to the number of attendees, regardless of whether or not, they choose to sleep at the event. Therefore, we advise purchasing your ticket early and planning your vacation time and travel, well in advance. Donations: If you would like to support these activities and provide additional funding after purchasing a ticket, or are unable to attend the event this time, but would like to contribute, we are announcing that we DO accept donations. Since this entire event is paid on behalf of the Zeitgeist Chapter Sweden, we will use this money to help with expenditures for this event, and to assist TZM Sweden in future efforts and activities. In accordance with the TZM train of thought, we only raise money for specified causes and for the non-profit efforts of our groups. Our primary goal is to conduct a successful event from which attendees will benefit and never forget. It is also our desire to increase activity and awareness within Sweden as well as the larger Scandinavian region, and to inspire people to participate in more TZM events and projects. We also wish to motivate foreigners to return to Sweden and be inspired to explore more of the country as well as partaking of future of TZM Sweden activities. While Viking lore is currently a popular topic, this is a great opportunity to show off some real Viking history from Sweden and creatively integrate this within the event. Similarly, we want to feature other aspects of Sweden’s history and its heritage, of which many people are likely ignorant, as well as understand modern Sweden and its famous welfare-society. There is a lot of work to be done and we need all the help from Sweden and all other parts of the world to make it better, so here is a start. We are more than thrilled to welcome you to this TZM European Meet-Up. The revolution is now – kom igen nu!